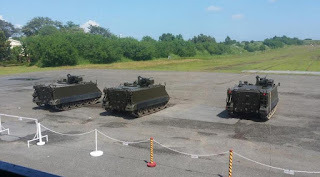 TARLAC, – On Monday, September 21, 2015, the Philippine Army showed and tested six of the 28 acquired M113A2 armored personnel carriers (APC) at Camp O'Donnell in Capas, Tarlac. The six refurbished APCs from Israel are equipped with remote controlled weapon station armed with 12.7mm heavy machine gun. Defense Secretary Voltaire Gazmin and Armed Forces of the Philippines (AFP) chief Gen. Hernando Iriberri personally observed the testing of the APCs. According to Gazmin, the AFP modernization fund financed the procurement of the 28 APCs – which cost more than $17.3 million. Gazmin said he is generally satisfied with the mobility and firefighting capabilities of the APCs. He added that this will boost the capability of the Philippine Army as it confronts internal and external security threats. Mechanized infantry division commander Major Gen. Mayoralgo Dela Cruz said most of the 28 APCs acquired from Israel will be brought to Mindanao. According to Dela Cruz, 114 more APCs—donated by the United States—are expected to arrive in the country before the end of the year. 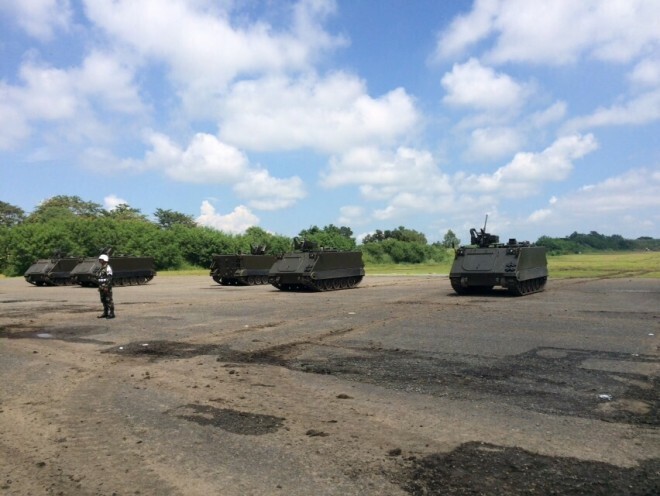 The Philippine Army field demonstration of the newly acquired M113a2 APC with remote controlled weapon system at Camp O'donnell, Capas, Tarlac, Philippines.